Summary: Rachel Blum and Andy Landis are just eight-years-old when they meet one night in an ER waiting room. Born with a congenial heart defect, Rachel is a veteran of hospitals, and she's intrigued by the boy who shows up alone with a broken arm. He tells her his name. She tells him a story. After Andy's taken back to a doctor and Rachel's sent back to her bed, they think they'll never see each other again. 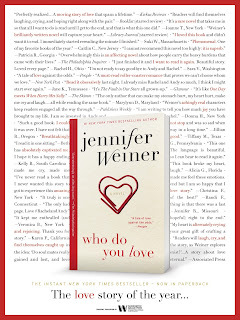 Late last summer, I reviewed WHO DO YOU LOVE by Jennifer Weiner. I have read all of Ms. Weiner's books and this one holds a special place in my heart. I adored this novel! The love story between Rachel and Andy is fantastic, and I really appreciated how Ms. Weiner developed their relationship through the years. It was fun to see them grow together, the grow apart, then grow together.... well you get the idea! I mentioned at the time of my review and I still think it's the case that WHO DO YOU LOVE would make a great book club selection. There is a reading guide available to those of you who like to have specific questions. Some of the themes you might want to explore include love, relationships, dreams, parent/child relationships, health issues, and self-identity. 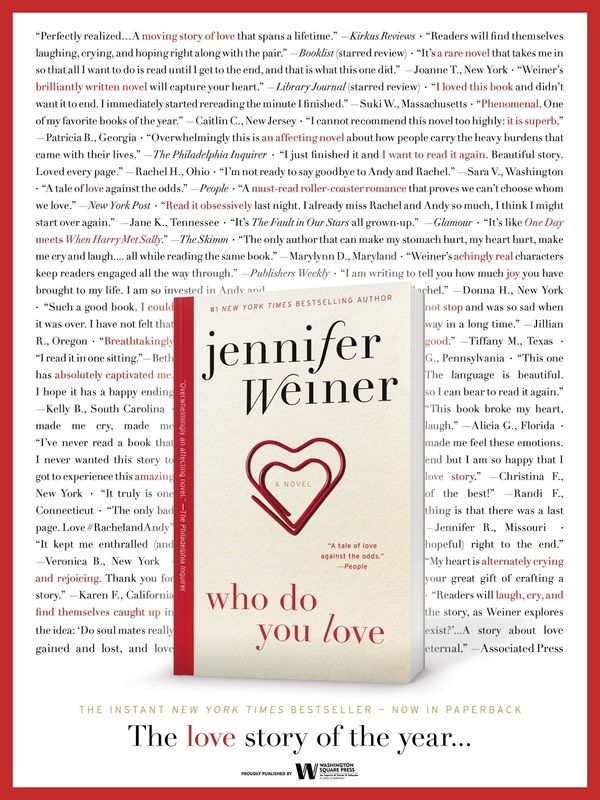 Today marks the paperback release of WHO DO YOU LOVE! Thanks to the fine folks at Washington Square Press, I have a copy of WHO DO YOU LOVE to share with one lucky reader. To enter, just fill out the form below before Monday, April 18th at 11:59 p.m. EST. I will randomly select and notify the winner the following day. This contest is open to those of you with U.S. addresses only. Good luck! Interesting....I was just 15 minutes ago thinking about how it has been a long time since I've picked something up by Jennifer Weiner. Maybe this one is next! Just letting you know that I accidentally entered twice. I put my address in the wrong space and when I went to correct it, I accidentally pushed enter before I could finish.....SORRY! 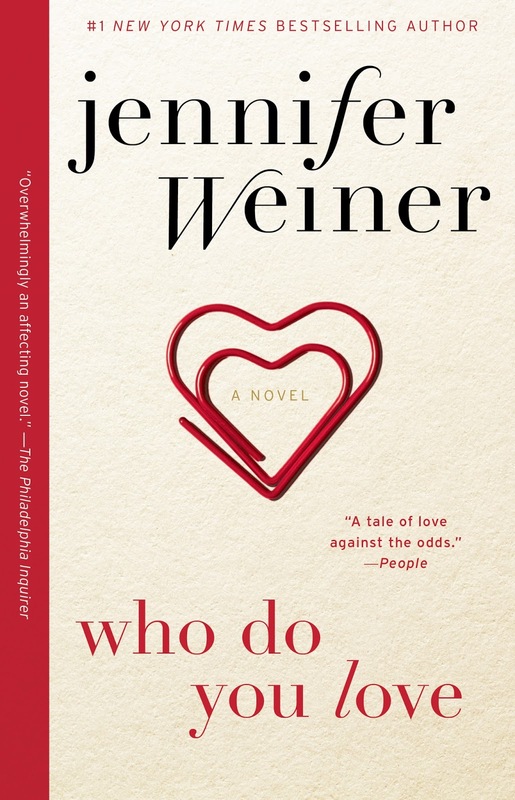 I have never read any of Jennifer Weiner's books. I do love the summary about this book, though! It definitely sounds like it's a great romance!